Later the stronghold of the Black Douglases, it has at its base an artillery fortification built before 1455 when James II besieged the castle. 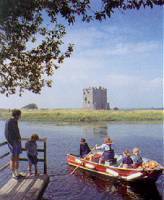 The Castle is on an island, approached by boat, with a long walk to the property. Three miles west of Castle Douglas on the A75.